Congratulations to Mary P., Taswmom, Colleen C., Amy P., Maureen C., Janet K., the winners in Cindy's giveaway. Thank you to all who participated! When you were growing up did you have parents that encouraged you to “reach for the stars?” Perhaps your mom told you: “You can be anything that you want to be.” This was not necessarily the case for me. Oh, don’t get me wrong I had great parents—they were just extremely realistic. Their advice consisted of: “Do well in school, get a job, get married, have children, and the rest will work itself out.” And if you break-down that advice, it was really quite solid—except it was never enough for yours truly. When I was a young girl, I dreamed of becoming a famous movie star. Okay, now there’s a dream that definitely falls in the unrealistic category, but a girl can dream, right? I am a firm believer that the Lord provides us exactly what we need. The good Lord provided me with a generous portion of talent in dance and I studied hard at many schools including, The Pittsburgh Ballet Theatre School, and with The Pittsburgh Dance Alloy at Carnegie Mellon to name a few. I wasn’t able to go to New York or Hollywood to chase my dreams—my parents wouldn’t hear of it, so I got a job and got married. I also kept dancing, and in 1985 my husband encouraged me to open a dance school. Well it wasn’t the original dream, but hey as I said the good Lord gives us what we need and here was an opportunity to have a career in dance, hopefully a successful career. My dance school was most successful. I began choreographing musicals on a local level and I choreographed an opera for the Pittsburgh Savoyards as well. I made my own schedule: four months off for summer, five days for Thanksgiving, and three weeks at Christmas. Not bad. My school was well known in the tri-state area and we faired quite well in competitions. When 2005 rolled around I turned my focus to writing. Don’t ask me why, but I started writing TV scripts. The Unbridled Series started out as a television drama and the Hollywood readers loved the show. I’d love to tell you that I was a huge success, but it just didn’t happen—we couldn’t sell the show to the producers. That’s right, the original dream for The Unbridled Series was for the television screen, and I’ve had reviewers mention that it would make a great TV show—yep, that’s what I thought, too. Anyway, when yet another producer turned the show down, one of the script readers suggested that I turn my scripts into a book series, and so I did. I had to adjust the dream. Am I disappointed? Discouraged? No way! Sometimes the dream that we are blessed with is not exactly the dream that we had in mind, but we have to be flexible enough to make the dream work—reach for a different star. So here I am: a movie star that became a dancer, er… a dance teacher, and a television writer that became an author—an author of two book series: The Unbridled Series and The First Force Series, again, not bad. Yep, the dreams have changed over time and that’s okay—I’m making it work, or maybe I’m working with it, but ya know what? I’m having a great time! Happy New Year! I’m so glad to be back at JRS! Let’s start 2015 out right—I’m going to give away six mobi files (for Kindle ereaders) of Into the Crossfire to six lucky romantic suspense readers! Leave a comment with your email address listed for the drawing! Good luck! THERE’S A SCORE TO SETTLE! A notorious killer leaves Jack Haliday’s world in shambles. It has been four years since ex Navy SEAL, Jack Haliday, had an explosive run-in with a biker gang wounding their leader, Gunner. During those years Jack had acquired everything he ever wanted: a beautiful wife, an adorable daughter, and a lovely home in the suburbs—everything was just about as perfect as it could get, until Gunner returned to twist Jack’s world inside-out with a vengeance that he could never have prepared for. Now Jack has a score to settle and he’s got some friends to help him do it! Laura and Lil walked out of the church hand-in-hand to make the short walk down the street to where their car was parked. Laura couldn’t help but feel a bit wary after their strange encounter with the rough-looking man. She tried to keep in mind that the man had come to the soup kitchen for a reason, and most likely it was much the same reason that the others gathered there—a hot meal. Lil was filled with such angst that Laura had never witnessed in her child. She tried to rationalize: Perhaps he looked like a bad guy that she had seen on TV, although Lil wasn’t allowed to watch much television. Laura let out a breath of relief. As Jack slid out of his vehicle, Lil ran into his arms. “Hey, there’s my girl,” Jack said. “We’ll talk about it later, Lil,” Laura said. “We’ll talk about it right now,” Jack insisted. On the drive home Jack’s gut was in a knot. Gunner had been at the soup kitchen. He was getting a closer look at his family. For twenty-six years Cindy’s life whirled around a song and a dance: she was a professional dancer/choreographer for most of her adult life and never gave much thought to a writing career until 2005. She often notes: Don’t ask me what happened, but suddenly I felt drawn to my computer to write about things I have experienced (greatly exaggerated upon of course—I’ve never been murdered!) with my husband’s Thoroughbreds and happenings at the racetrack. Viola! Cindy’s first book series, Unbridled, was born—there are five books to that series so far. 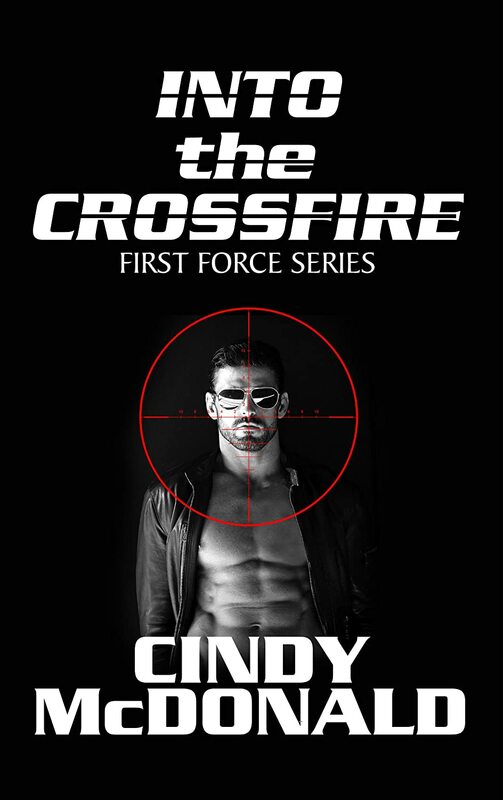 Cindy is a huge fan of romantic suspense series, and although she isn’t one to make New Year’s resolutions, on New Year’s Day 2013 she made a commitment to write one, Into the Crossfire is the first book for her new series, First Force. Book #2 released in September titled To the Breaking Pointe, and Book #3, Into the Dark, will release in September of 2015. People are always asking Cindy: do you miss dance? With a bitter sweet smile on her lips she tells them: Sometimes I do. I miss my students. I miss choreographing musicals, but I love my books, and I love sharing them with my readers. Giveaway ends 11:59pm EST January 8th. Please supply your email in the post. You may use spaces or full text for security. (ex. jsmith at gmail dot com) If you do not wish to supply your email, or have trouble posting, please email maureen@justromanticsuspense.com with a subject title of JRS GIVEAWAY to be entered in the current giveaway. Your cover caught my attention & the interesting storyline. You never know what life will bring you. Congratulations on your success! Sounds chilling! Thanks for the post. Happy New Year! Thanks for sharing a bit about your new book/ series! I love the sound of Into The Crossfire. Anything with a SEAL in it gets my attention right away but I must say the blurb has me curious about how Jack handles Gunner when he comes back into his life. My parents made sure we had our feet firmly planted. Dreams were just that. For dreaming.